Date Published: 1880. Verso: blank on the reverse, does have the County written lightly in pencil. From a disbound antique atlas. Condition: reasonable, spotting and browning due to age. Thank you for looking at this Original Antique Map Date: 1887 I make a lot of effort to try and get the age of an item as close as possible. If you feel that I have the age of an item wrong please let me know before purchase. Size: see photos Condition: good for its age I provide quality photographs and these should studied as they form part of the description. Verso: Your map is blank on the reverse. Notes: All our Photographs / Postcards / Ephemera / Maps are original we do not deal in copies or reproductions We are collectors and lovers of old Books, Prints, photographs, postcards and ephemera not just traders. Your item will be sent in a hardback envelope. We ship within one business day If you require any special requirements please contact to discuss For any issues or questions please contact us via eBay. Thank you for looking at this lovely Antique Map from 1882 All my items are originals and in excellent condition unless indicted. Size:see photos Provenance/Description/Publisher: George Philip & Son, Published 1882 Your map may have tear lines along the fold so Please check picture for that and any foxing etc, your map is blank on the reverse It comes un-mounted and un-framed. Date Published: 1884. Location Code: Gazetteer, Scotland P6. Blank on the reverse. Original (i.e. 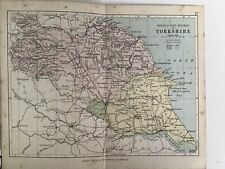 not a later reproduction) Victorian coloured map of "Yorkshire, parts of the East & West Riding" England DATE PRINTED: c.1850 SIZE: Paper size is approximately 29 x 24 cm (11.5 x 9.5 inches) Printed map approximately 23 x 17.5 cm (9 x 7 inches) ARTIST/CARTOGRAPHER/ENGRAVER: Engraved by Joshua Archer. PROVENANCE: This map was originally published in Thomas Dugdale’s "Curiosities of Great Britain. England and Wales Delineated” TYPE: Steel engraving printed on paper. VERSO: Reverse side is blank. Original (i.e. not a later reproduction) Victorian coloured map of "Monmouthshire" in Wales DATE PRINTED: c.1850 SIZE: Paper size is approximately 29 x 24 cm (11.5 x 9.5 inches) Printed map approximately 23 x 17.5 cm (9 x 7 inches) ARTIST/CARTOGRAPHER/ENGRAVER: Engraved by Joshua Archer. PROVENANCE: This map was originally published in Thomas Dugdale’s "Curiosities of Great Britain. 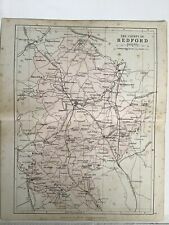 England and Wales Delineated” TYPE: Steel engraving printed on paper. VERSO: Reverse side is blank. Original (i.e. not a later reproduction) Victorian coloured map of "Glamorganshire" in Wales DATE PRINTED: c.1850 SIZE: Paper size is approximately 29 x 24 cm (11.5 x 9.5 inches) Printed map approximately 23 x 17.5 cm (9 x 7 inches) ARTIST/CARTOGRAPHER/ENGRAVER: Engraved by Joshua Archer. PROVENANCE: This map was originally published in Thomas Dugdale’s "Curiosities of Great Britain. 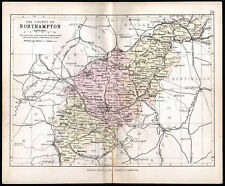 England and Wales Delineated” TYPE: Steel engraving printed on paper. VERSO: Reverse side is blank. 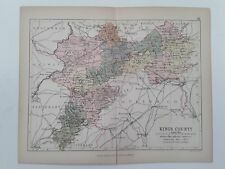 Thank you for looking at this lovely Antique County Map from 1878 All my items are originals and in excellent condition unless indicted. Size: see photos Provenance/Description/Publisher: George Philip & Son, Published 1878 Please check the main picture for any foxing etc, your map is blank on the reverse. It comes un-mounted and un-framed. There may be some splitting along the fold line. 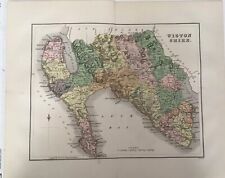 Thank you for looking at this lovely Antique Map from 1882 All my items are originals and in excellent condition unless indicted. Size:see photos Provenance/Description/Publisher: George Philip &amp; Son, Published 1882 Your map may have tear lines along the fold so Please check picture for that and any foxing etc, your map is blank on the reverse It comes un-mounted and un-framed. Thank you for looking at this Map Date: 1899 I make a lot of effort to try and get the age of an item as close as possible. If you feel that I have the age of an item wrong please let me know before purchase. Size: see photos. Condition: excellent I provide quality photographs and these should studied as they form part of the description. Verso: Your map is blank on the reverse Notes: All our Photographs / Postcards / Ephemera / Maps are original we do not deal in copies or reproductions We are collectors and lovers of old Books, Prints, photographs, postcards and ephemera not just traders. Your item will be sent in a hardback envelope. We ship within one business day If you require any special requirements please contact to discuss For any issues or questions please contact us via eBay or by emailing us at . Date Published: 1880. Verso: blank on the reverse, does have the County written lightly in pencil. From a disbound antique atlas. Thank you for looking at this Original antique map. Size: shown in inches. Condition: excellent we provide quality photographs and these should studied as they form part of the description. Verso: Your map is blank on the reverse. Loc. P4 - Gazetteer. Thank you for looking at this lovely Antique County Map from 1878 All my items are originals and in excellent condition unless indicted. Size: see photos Provenance/Description/Publisher: George Philip & Son, Published 1878 Please check the main picture for any foxing etc, your map is blank on the reverse. It comes un-mounted and un-framed. There is some splitting along the fold line. Thank you for looking at this Map Date: 1894 I make a lot of effort to try and get the age of an item as close as possible. If you feel that I have the age of an item wrong please let me know before purchase. Size: see photos. Condition: excellent I provide quality photographs and these should studied as they form part of the description. Verso: Your map may have another map or text on the reverse Notes: All our Photographs / Postcards / Ephemera / Maps are original we do not deal in copies or reproductions We are collectors and lovers of old Books, Prints, photographs, postcards and ephemera not just traders. Your item will be sent in a hardback envelope.